Today I decided to upgrade my Surface Pro running Windows 8.1 to the Windows 10 Technical Preview. 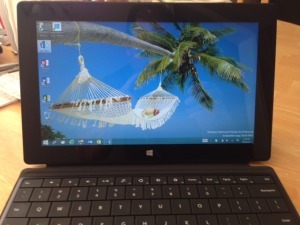 I copied the ISO to a USB and inserted into the Surface. I kicked off Setup and first option was to Choose what to Keep. You have three choices here depending on what you want to keep. I chose the option to Keep Windows settings, personal files, and apps and moved on. after confirmation, the installation continues and about 20 mins later, Viola! 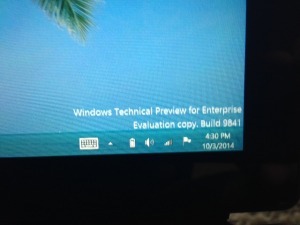 Windows Technical Preview for Enterprise. After the install I noticed that the new Start Menu was not present, probably because I choose to keep my settings and the old setting for the Start menu remained. You can enable it by right-clicking the taskbar and going into the properties page for the Taskbar and Start Menu. Under the Start Menu select “Use the Start menu instead of the Start screen”. This shows you just how simple this upgrade really is. I was curious to see what was working and what wasn’t. To my surprise everything just worked, Office 365, Lync , and OneDrive. Good job Microsoft. Today, Microsoft made available their vNext Technical Previews of Windows Server, System Center and their desktop version Windows 10. 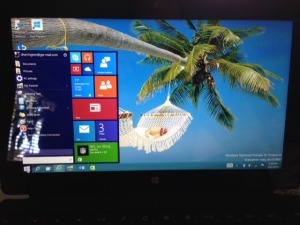 There have been lots of comments across the internet on why Microsoft skipped Windows 9. 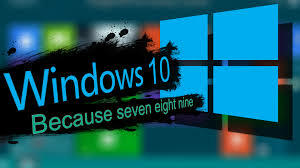 For example, Windows 8.1 was really 8+1 which equals 9, so 10 was the next in succession. The funniest one I saw was that seven(7) ate(8) nine(9), therefore 10 was the magic number. There were other comments around the older OS’s having already used 95 and 98. Either way, the name really doesn’t matter to me. What is important is the functionality and how productivity can be improved. After all, there will always be someone who doesn’t like the chosen name. For a First Look at Windows 10 media briefing held in San Francisco on September 30th, click here. Download the Technical Preview and join the Insider Program to help shape Windows 10. So, in conjunction with the aforementioned, I felt it only fitting to “Go live” with my new blog today. I plan to post frequent updates around a variety of topics. I hope that you will find something of interest to you in this blog and will continue to follow and share with others.